Doug Manchester’s proposed development at the site of the current U-T building. If you want to destroy Mission Valley, what’s coming down the development pipeline will surely do it for you. There are four massive residential and commercial projects and another giant handful of minor ones- all in various stages of blueprints, planning and construction – heading for this landmark river canyon. If all are built – the total impact would permanently damage Mission Valley to the point where the Valley that we now know would no longer be there. Some old-timers believe Mission Valley was destroyed a long time ago, when it was a long, lush valley of dairy farms and agricultural fields. 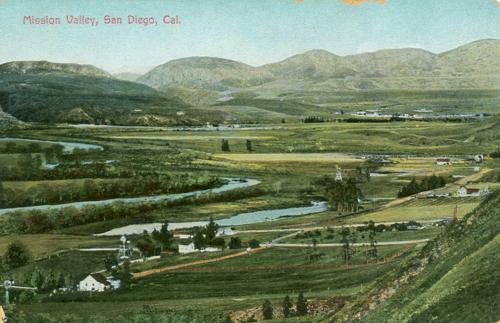 Then the hotels, resorts, golf courses and freeways came and Mission Valley lost its beauty, serenity, and its soul. Ironically then, there’s also another group of “old-timers” – a special group – a group of Mission Valley landowning families – who have their own plans to develop and damage the Valley even further. But despite all their fancy drawings and brochures, and high-priced architects, the developers could very well ignite a backlash against their projects, a backlash that could possibly stall some of the damage and destruction, a backlash made up of a possible combination of Mission Valley residents, local ecologists, naturalists and San Diegans with common sense. This potential conflict over the future of Mission Valley development is only in the ether right now. But this is not the first time there has been conflict over Mission Valley and what direction it should take. In fact, back in the late 1950’s – there was a virtual battle going on over the Valley by two different warring camps of the establishment, different factions of the privileged elite, each with their own development agendas. Noted urbanologist Mike Davis, devotes an entire subsection entitled the “Battle of Mission Valley” in his colloborative book Under the Perfect Sun. Once the valley was saved from future flooding by the construction of dams up the river, it was clear that more than dairy farms, alfalfa fields and sand-gravel mining pits could survive. 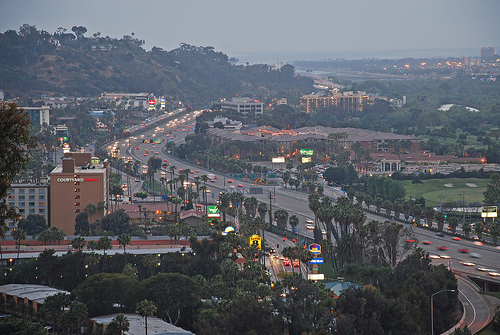 And with the construction of I-8, Mission Valley’s commercial potential was tremendously enhanced. The Browns, the Hazards, the Hahns represented the “new money” of San Diego’s elites. They had a separate agenda than the older network of wealthy families who had been running the city, like the Jessops and the Marstons – whose wealth came mainly from downtown retail, real estate and banking. The old money wanted to focus any redevelopment on the downtown area, a new convention center, a new trendy mall. The conflict all came down to a number of City Council meetings in June of 1958 during which the warring factions of the elites each made their case to the politicians. Concrete commercial sprawl and huge interstate freeway exchanges engulfed the greenest parts of the valley while the oldest developed portion, the motel and resort strip west of Texas Street, slowly lapsed into a tawdry decrepitude. In the 1970s, “progressive” planning added intensive residential development as well, but with no schools, libraries, or (until relatively late) supermarkets, so that only childless people need to apply. So, if Mission Valley is already “destroyed”, what more can damage it? Plenty, and this very special group of “old-timers” is about to do that very thing – further destroy Mission Valley. This group is not an actual organization but more of a network of similarly situated property-owning wealthy families made of some of the very descendents of the San Diegans who’ve owned major parcels of Mission Valley, such as the Browns – the same Browns who opened the first hotel -, the Cushmans, and the Grants. Each family has their own plans and financial partners. Still, many San Diegans never knew a Mission Valley as the old-timers picture it, and have taken for granted its development, the malls, movie theaters, restaurants, office buildings, stadium, parking lots, trolley, river, condos, apartments and horrible traffic. People really never used to live in Mission Valley, as the old-timers knew it – sure, a few did, there were a few houses here and there throughout the valley, but not the thousands that live there now. It’s estimated that Mission Valley now has about 20,000 residents living in roughly 12,000 residential units. This is the modern reality of San Diego’s longest and most central valley. These four major development projects along with the “minor” ones, all slated for Mission Valley – in the pipeline – with one already being developed – will actually destroy what’s left of the Valley. If all the units and commercial projects are built that are being currently planned, they will double the population of Mission Valley and double the number of residential units. There will be 40,000 residents living in 24,000 units. 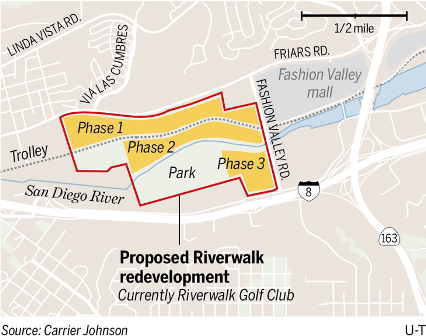 Levi-Cushman family and Related California project: 4,000 apartments and condos planned for a $2 Billion project at the west end of Mission Valley, at the current location of the Riverwalk Golf Club course, very near Fashion Valley. The first phase of the 20-year plan includes 3,000 homes in 3 and 4 story buildings on 65 acres between Friars Road and the San Diego Trolley line. Phase No. 2 has 1,000 units in 2 – 3 story buildings on 35 acres. And finally, the 3rd phase includes the construction of 30 acres of commercial and mixed-use – which may include a hotel. They do plan a park, one for both sides of the San Diego River that totals 70 acres. Atlas Hotels and Lowe Enterprises: Right across the street from the current golf course – and probable future of the Cushman project – is the old, historic Town & Country Hotel that C.J. Brown built, sitting there with 950 hotel rooms and 200,000 square feet of convention and meeting space. The site is up for some serious renovation as Atlas Hotels – owned by the Brown family – and Lowe Enterprises have partnered to do a make-over. Their plans include multi-family housing and maybe a new hotel. Civita – Grant family and Sudberry Properties: this is the largest project – formerly called the Quarry Falls Community – a $2 Billion master planned “village” on 230 acres – with much of it is already underway. Artist rendering of Civita’s “urban village”. When completed, it will include nearly 5,000 residential units – with 478 being affordable, one million square feet of commercial space – split into retail and office, a 19 acre park and 40 or so acres of “open space” – all on top of the old rock quarry that the Grant family operated since the 1930s. Units for sale in Civita. Developers first broke ground in 2010, the first homes were occupied a year later. And during the first half of 2014, 105 homes were reportedly sold. Everybody cites the innovation, the contemporary architecture, the “urban village” design of Civita, – why it even already has its own wikipedia page. Doug Manchester’s luxury housing and commercial project: this is one of the most significant of the new developments coming down the pipeline. Whether Manchester sells or hands over the U-T San Diego newspaper to somebody else or not, he will still retain the property the business office and parking lot are on. And he has big plans for the site. 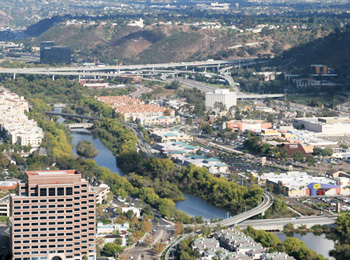 Scaled down from its original outrageous design (which included a 22-story tower and a 10-story office building), the current blue-prints call for a bulky and massive mid-rise residential structure with hundreds of residential units where the parking lot is now near the San Diego River. 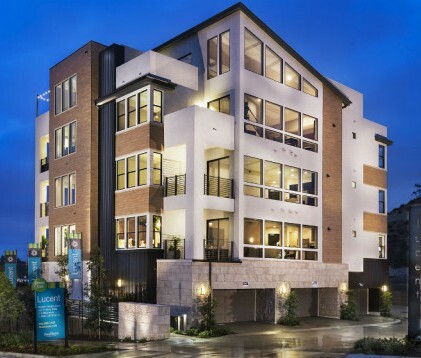 The residential structure steps down from 7 stories at the south end to 2 stories at the north end, with parking included on the first two levels. East side of Manchester’s project. Manchester’s project will be massive, but only includes less than 1 acre for a park along the San Diego River. Manchester has more going for him. Perry Dealy, who works for him as a consulting development manager in his Manchester Financial Group, is on the Mission Valley planning group. Coincidentally, there’s also a Grant and a Brown on the same planning committee. Marriot Residence Inn on the former El Torito site. Notice, there’s no mention, yet, of the Qualcomm stadium site, a place developers have been drooling over for years. Now, of course, these projects will not be constructed at the same time, and many of them have multiple phases slated over the next 20 years or so. But still, if built, there will be double the number of current residents in Mission Valley. If the Riverwalk golf course is taken over by nearly 5,000 units, if the development Civita is completed, if Doug Manchester’s mixed-use project is built, if the Town & Country renovation takes off, if Hazard Center is turned into two high-rise towers, then what’s left of Mission Valley would have been destroyed – and it would have been destroyed in order to save it – save it for the developers. How, you ask, can Mission Valley actually be further destroyed? Without dealing with the issue of water – like where is it all coming from, and apart from the doubling of the population and number of apartments, condos and other units, there are the huge and breaking strains on the infrastructure and immediate environment. Traffic will more than double, as with all the commercial expansions, many more vehicle-trips will be seen. All spinoff pollution will engulf the residents and ecology. Sure, the trolley is there, and the freeways are close, but there’s already talk of having to reconfigure the major freeway interchanges in the Valley, the 163 and the 805. Not being discussed fully is the total lack of infrastructure for another 12,000 residential units. There are no public schools in Mission Valley, maybe one fire station, one library, no police stations, no non-profit medical clinics. Even on the private side, no local markets to grab a carton of milk or baby diapers or a pack of smokes. There’s hardly any gas stations. There’s a serious lack of public facilities now for the current residents, and the emphasis on them in the blueprints, drawings, plans, presentations for these future projects is woefully inadequate and understated. This is not surprising because San Diego is notorious for historically not preparing adequate infrastructure for future needs. This historic trend includes the days during World War II when San Diego’s sewer system was so bad – it emptied into San Diego Bay – that the Navy had to step in and deal with it. It includes the absence of public facilities in San Diego’s mid-city during the 1990s. And it includes Mission Valley right now, today. The entire Mission Valley of today is built around the automobile. Yes, some of the projects are designed to be “walkable” and have plans to build parks (Manchester wants to build .8 acre park), and Civita is installing a park, but from the past experiences of San Diego developers, parks are the last things built – if ever (thinking of Liberty Station here). So, if these massive projects are built, then Mission Valley will continue on its path of destruction. The Mission Valley projects – fueled by property-owning families cashing in on the economic upswing – will alter forever the place – and what future generations of San Diegans will come to know as Mission Valley will not be the Mission Valley that we know today. If there is a backlash against the developments, then there needs to be a discussion about the problems and options and what’s to be done. So, let part of that discussion begin here and now. Those who forget the past…but we know they always do, don’t we? Yes, Mr. Gormlie, let’s begin. This excellent overview is truly just the beginning; there could be a complete story on each of the items you cite. I’m one of those who say that “Concrete Valley” was destroyed 20 – 25 years ago and that all since then is already further destruction. To read about these projects now “in the pipeline” is mind-boggling. After the totally toxic addition of massive Civita, I didn’t know there was any more construction actually planned for the valley. No surprise that Manchester and Cushman are behind some of it. These two men have been on my list of Enemies of San Diego for years. There are a few things you’ve failed to mention. You cite air pollution effects of more-than-double the amount of traffic but don’t expand upon the likelihood of creating an L.A.-like brown zone right in the middle of San Diego. If the freeway interchanges need reconstruction, that’s a CalTrans matter. How long would that take? Also, the total lack of schools almost guarantees that no families will live there, dooming the entire valley as one huge commuter zone. There is one positive for me. That even 4,000 apartments is better land use than a golf course. Oh, and the name Dinnerstein is great. But, the main question is: what can we do to nip it all in the bud BEFORE anything after Civita gets built?? The past isn’t forgotten; we must turn backlash into action or we lose it … again. Mission Valley has long been planned as a desirable urban node to accommodate San Diego growth but to me it looks more like a sad example of urban blight. You’ve done a terrific (though depressing) job of describing the place and its intended future and ringing some alarm bells. C.J. Brown was a complete jerk. In the late 50ies I worked at the Town and Country as a bellman to put myself thru SD State. Brown had a policy that bellmen could not accept tips for helping a guest to his room with all the luggage. I didn’t last long!! Frank Gormlie! This was a step-by-step description of a trip about to be taken to hell. Only a week I found myself trapped on one of the Caminos in a line of unmoving single-occupancy SUVs. I turned into a huge parking lot, thinking I could get to an outlet closer to the freeway and instead was forced into a one-way, no-exit-here, no left turn, dead-end labyrinth that took perhaps 10 to 15 minutes out of my life. None of the local and national psychopaths involved in this Growth explosion are offering explanations of the cost of adding another freeway with aerial connecting loops to service the doubling of Mission Valley’s population. This is gonna be Blade Runner; a fitting memorial to unlimited greed. I am going to laugh, and hopefully be in a position to record this, when a tsunami drives a bore straight up the river valley (as nature intended) and rinses all that concrete garbage out to sea. Really? I should have sympathy for anyone living in a river valley? Yeah, like I feel sorry for the idiots whose homes are poised on the edge of sea coast sandstone. In other words, not much. You chose to live in a river valley that, in the 1800s, was filled with water. Someday the river valley will be forcibly returned to its original state. Until then, you idiot monkeys can do whatever you want. Well, here is the solution! Double-deck the 8 from OB to El Cajon! Traffic in and traffic out! And build a stadium in the sky! I’ll never live in Disney Valley. Didn’t someone at sometime say: “Never build on a dry river bed?” Several years back, during almost a week of heavy rains, workers on both the north and south sides of Highway 8 were sent home before noon, because a dam east of Highway 805 might collapse and wipe out the 805 bridge. I’m just saying maybe all the new planned expansion may well include a row boat shop (yuk-yuk-yuk)!